*Be sure to adjust this lesson to fit the needs of your students. As you walk down the aisle to sit, be mindful of the Presence of God. We should be quiet while we find a seat and try not to distract others. When you finally choose a row to sit at, genuflect toward the front of the church to where the tabernacle is which contains the Blessed Sacrament. When you genuflect you lower yourself onto your right knee until it touches the floor. At the same time we make the Sign of the Cross. If the tabernacle is not in the main body of the church or if the sanctuary lamp is not lit, signifying that the tabernacle is empty (on Good Friday and at the beginning of the Easter Vigil Mass) you should make a profound bow toward the altar. A profound bow is when you bend forward at the waist completely. If there are kneelers where you are sitting you make the Sign of the Cross and kneel. If there are no kneelers you sit in a prayerful posture with your hands resting on your lap. Prepare yourself and clear your mind for God. Sometimes it is helpful to pray a few memorized prayers, but these should always be followed by a real conversation with God. Tell Him what is on your mind and reflect on where God is in your life as you kneel or sit in the church. 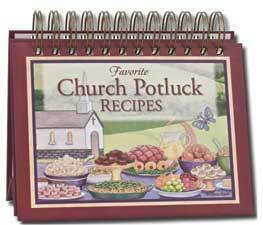 Make a prayer book to take with you to Mass. emmausroad.org- Page 7. This craft will make a decorative prayer book. You can also put more prayers inside the book. Suggestions on how to make the book using other materials is posted on page 8. These games below are free, however they can only to be used for classroom and personal use. They may not be published on any websites or other electronic media, or distributed in newsletters, bulletins, or any other form or sold for profit. Reproduction or retransmission of any materials, in whole or in part, in any manner, is not permitted. Introduce game: Let’s see how well you have been listening. See if you can answer the questions correctly by acting out what you should do. Directions- Have the students stand beside their chair or desk. Ask the questions below and the students must act out what they should do. Introduce game: How well do you know your prayers? Let’s find out! 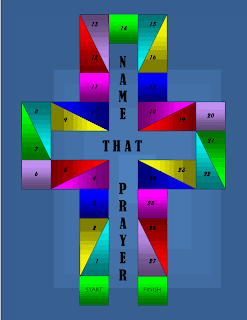 Name That Prayer File Folder Game- The objective of the game is to get to FINISH first by answering questions about prayers. Review all or just a few of the prayers. The puzzle below is free, however it can only to be used for classroom and personal use. It may not be published on any websites or other electronic media, or distributed in newsletters, bulletins, or any other form or sold for profit. Reproduction or retransmission of any materials, in whole or in part, in any manner, is not permitted. 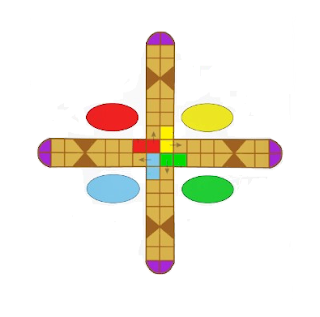 Entering the Church (crossword)- For younger students you can do this together on the board. A story wheel can be used with any lesson you are teaching. They are also a great way to supplement your Bible stories and help your students to remember the lesson. Children turn their story wheel dial to retell the Bible story they learned over and over again. Story wheels can be made with 2 paper plates or you can use cardstock or tagboard. Just print out small coloring pictures for the student to color and glue on to the story wheel. Or you can use stickers to help tell the Bible story. Here are a few I made. These activities are free, however they are only to be used for classroom and personal use. They may not be published on any websites or other electronic media, or distributed in newsletters, bulletins, or any other form or sold for profit. All graphics/images/clipart etc. used on these activities are not my own and are from various internet sources. Directions: Print the top and bottom wheels out on cardstock. Cut out wheels. Cut out the window on the top wheel so you can see the pictures as you turn it. Have children color wheels. Attach a brass fastener through the center of both wheels. On the back of the bottom wheel attach a strip of cardstock (at least 1 inch wide and 6 inches long) leaving half extended over the side (so you can turn the wheel). You can also draw an arrow on the top side of the strip on the end to indicate which way to turn the bottom wheel. 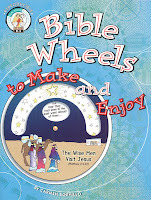 Bible Wheels To Make and Enjoy by Carmen Sorvillo- Bible Wheels are Bible stories on wheels that help reinforce Bible stories. 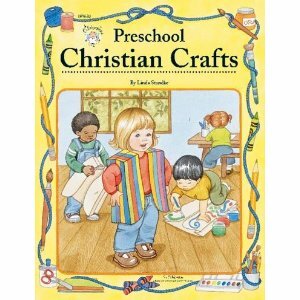 Children ages 4 to 7 can make the Bible Wheels easily by cutting them out, coloring, and assembling. Each wheel is made from two reproducible patterns that you can print out on cardstock and are secured with a brass fastener. A window in the wheel reveals what happens in the Bible story and the children can turn the wheel dial to retell the Bible story they just learned over and over again. Bible Wheels are a great way to supplement your Bible stories and help your students to remember the lesson. Children are fascinated by how they work and the Bible Wheels in this book will surely keep the children’s attention and spark their imagination. The book contains 30 (14 Old and 16 New Testament) Bible Wheels that have limited text with the title of the story, the Bible reference and pictures telling the Bible story on each one. Cutting is simple but for younger students you might want to cut out all or some of the craft prior to class. 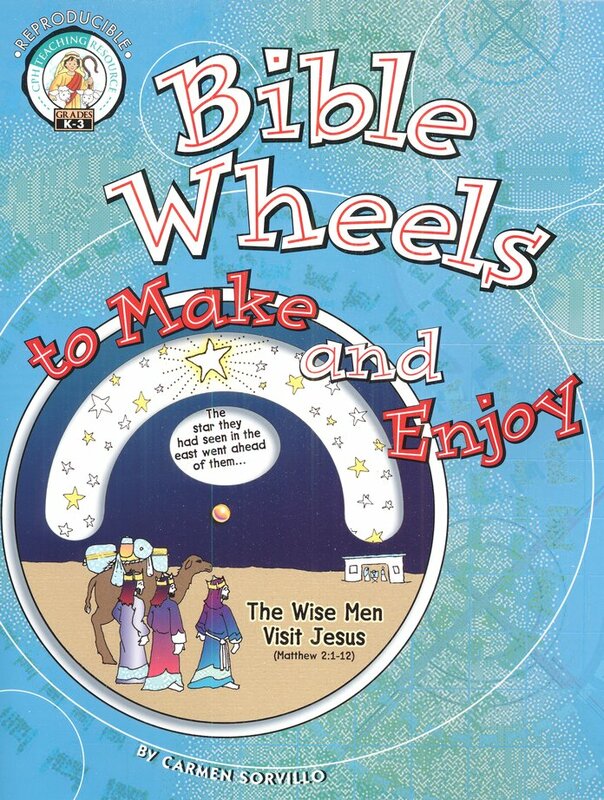 Bible Wheels are a great take home activity for children to do with their parents and they are an excellent way to help the children remember the Bible story. Click here to see some of the book then click on Excerpt. 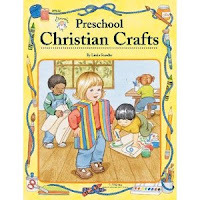 Directions on how to make a story wheel and patterns are included in this book for various Bible stories. 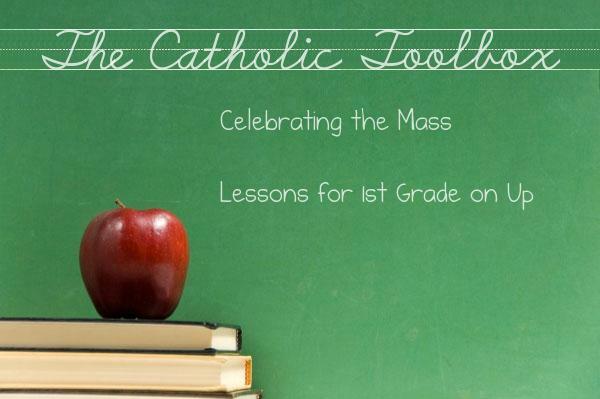 These activities can be reviewed several times during the year to help students remember and comprehend all the people and liturgical objects at Mass. There are many people working together to celebrate Mass. We combine many voices and talents to make each Mass special. We have all seen men, women and some children help during Mass. These are usually people who have volunteered to read the readings, psalms, and help with other parts of the Mass on a more or less regular basis. At many parishes, these volunteers take turns, rotating during the course of a week or month so everyone has a chance. Who are these people? What do we call them? What are their job responsibilities? These activities below are free, however they can only to be used for classroom and personal use. They may not be published on any websites or other electronic media, or distributed in newsletters, bulletins, or any other form or sold for profit. Reproduction or retransmission of any materials, in whole or in part, in any manner, is not permitted. All graphics/images/clipart etc. used on these activities are not my own and are from various internet sources. People at Church Cards- Show each card to the students and have them identify the person(s) and what they do. (Altar Servers, Cantor, Choir, Eucharistic Ministers, Greeter/Usher, Lector, Musicians, Priest). They can also play Memory or Go Fish with these cards. Who am I? (card game)- Children can play Memory or Go Fish with the cards by matching the pictures of people from church with the correct name. Who am I? File Folder Game (for younger students)- Place your markers on START. The player rolls the die and follows the directions. If you land on a space with a person’s job description (even if you were told to go back) you read it out loud and you must say who that person is. (If they cannot read, the teacher or someone else can read it for them). If you are correct, you stay where you are. If you are not correct, you go back two spaces and read that job description and say who that person is. If you are correct, you stay where you are. If you are not correct, you go back two spaces, etc. If you land on a picture of a person(s) you must say who that person is. Same rules apply for the picture identification as well. The first person to move around the board and land on FINISH wins. Continue playing to find out who comes in second, third, fourth, etc. place. Who am I? File Folder Game- Identify the person at church by their job description. Place your markers on START. The player rolls a die and follows the directions. If you land on a space with a person’s job description (even if you were told to go back) you read it out loud and you must say who that person is. If you are correct you stay where you are. If you are not correct you go back two spaces and read that job description and say who that person is. If you are correct you stay where you are. If you are not correct you go back two spaces, etc. The first person to move around the board and land on FINISH wins. People at Mass- Match the words in the first column to the best available answer in the second column. (Say a word from the first column and then give your child two choices to pick from in the second column). There are also several items use using during Mass. We used certain items during Mass to remind us of the holiness of the celebration. Can you name some of them? What do we do with these? Treasure Hunt- Take the students on a tour of the church and point out and discuss items found there. Divide the students into small groups. Give each group a clipboard with a list of objects. The students have to locate each item and write down where it is located in the church. These activities below are free, however they can only to be used for classroom and personal use. They may not be published on any websites or other electronic media, or distributed in newsletters, bulletins, or any other form or sold for profit. Reproduction or retransmission of any materials, in whole or in part, in any manner, is not permitted. All graphics/images/clipart etc. used on these games are not my own and are from various internet sources. Liturgical Objects Used in Mass Cards- Show Liturgical Objects Used as Mass cards to the students and have them identify the object. *Children can play Memory or Go Fish with the cards (make 2 copies) by matching the pictures of liturgical objects. 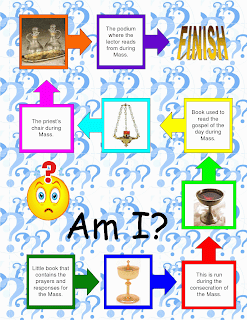 What am I?- Have your class work together to make riddles for objects used in Mass. Then have the students take turns reading their riddles to the class. Or you can play this game using the riddles provided. What Am I? (file folder game)- Identify objects used during Mass by description or picture. Place your markers on START. The player rolls a die and follows the directions. If you land on a space with a description of an object used at Mass (even if you were told to go back) you read it out loud and you must say what that object is. (If they cannot read, the teacher or someone else can read it for them). If you are correct, you stay where you are. If you are not correct, you go back two spaces and read that description and say what that object is. If you are correct, you stay where you are. If you are not correct, you go back two spaces, etc. If you land on a picture of an object used at Mass you must say what that object is. Same rules apply for the picture identification as well. The first person to move around the board and land on FINISH wins. Liturgical Bingo- Students play regular bingo, but they answer questions about Liturgical items used at Mass. 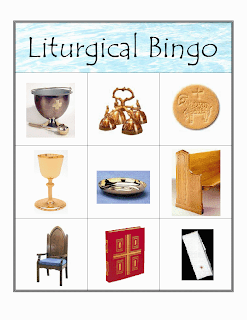 Picture Liturgical Bingo- Students play Liturgical Bingo, but with pictures. Participants and Liturgical Objects Used in Mass- The ultimate objective is to move all of your game pieces off of the board before your opponent does and to have the largest number of game pieces remaining in your possession. This game can be played individually or in teams. 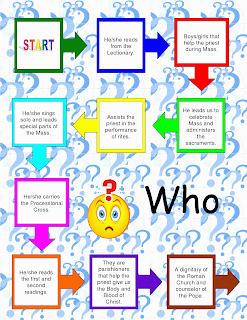 Liturgical Quiz (hard)- Fill in the missing blanks with the correct word. Word bank provided. 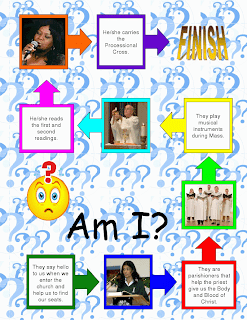 Liturgical Chart- Cut out the picture and paste in the correct box. 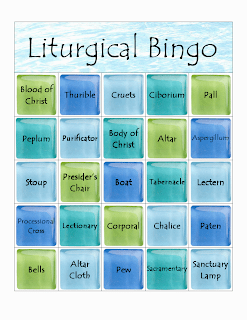 Liturgical Chart- Fill out the definitions of each object. Cut out the picture and put in the correct box. 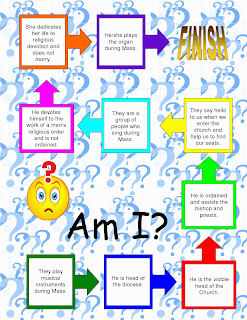 Liturgical Chart Pictures- Pictures to cut out and paste on the Liturgical Chart. 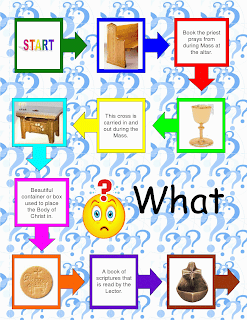 Liturgical Objects in Church (6 objects)- Write the name of the object in the blank. (Ideas for younger students are given). Do You Know What These Are? (9 objects)- Match the answer with the correct picture. 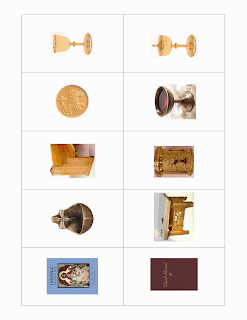 Liturgical Objects in Church (12 objects)- Do you know what these are? (Ideas for younger students are given). Liturgical Objects in Church (12 objects)- More Objects Used at Mass. Write what the object is in the space provided. For younger students you can use a word bank on the board. Liturgical Objects Used at Mass- Directions: Write the correct number of the object in the blank. For younger students: Teacher will write on the board a word from the list. The teacher will then read the word and definition to the students and they will answer out loud during class the correct number. Have students write down the correct number beside the word. *Lesson #1 will be posted on Friday. There will be 22 lessons in all. Young Ruler Word Wall- Word wall templates are large flash card printables that you can hang on the wall to aid children when they are learning or using new vocabulary words. (When you use these cards ask the students and discuss, “What do you love?” and “Who do you love?”). Read story: “The Rich Young Ruler” from your own story book. What did the young man ask Jesus? How to get to heaven. What did Jesus tell him? That he had to obey all the commandments. What did Jesus tell the man to do with all his things? To sell everything he had and give the money to the poor. Why did the man not follow Jesus? He did not want to give up all the things he had. Which did the man love more- his things or God? His things. Jesus said it is hard for a rich man to enter God’s kingdom. What did he compare it to? A camel going through the eye of a needle. 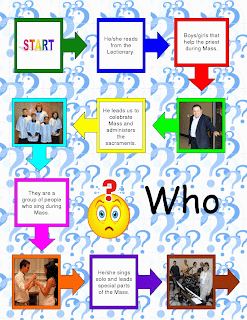 Introduce activity: What did the young man ask Jesus? How to get to heaven. mssscrafts.com- This craft involves making a small booklet which will illustrate how we can share or help others. It can be adapted for both preschool or primary (elementary) aged children by changing expectations for the inside content. Need: Paper plates, markers or crayons, paper punch, and yarn. Directions: Give each child a paper plate on which you have written the words on the bottom of the plate: loves God above all things. Have each child write their name at the top of the plate (write their names if they need help). Then have them draw pictures of themselves below their name (in the middle of the paper plate) and decorate the plate using the crayons or markers (glitter would add that special touch). Punch a hole in the center top of each plate and add a piece of yarn to hang. Write “Love God with all your heart.” inside the heart to make these crafts. Introduce game: Why did the man not follow Jesus? He did not want to give up all the things he had. *The name Ahasuerus is equivalent to his Greek name of Xerxes, both deriving from the Old Persian language Khashayarsha. Xerxes Word Wall- Word wall templates are large flash card printables that you can hang on the wall to aid children when they are learning or using new vocabulary words. Purim is a Jewish holiday celebrating the salvation of the Persian Jews from Haman’s evil plot to have them all killed. It is tradition to use noise makers (gragger as they are called in Hebrew) to make as much noise as possible whenever Haman’s name is mentioned when you read the story. The purpose is to stamp down or blot out Haman’s name which comes from the book of Deuteronomy which says, “You shall blot out the memory of the Amalekites (Haman’s people) from under the heavens.” Encourage the children to boo or hiss when the name of Haman is mentioned and cheer when Esther and Mordecai are mentioned. *Have the children say “X” whenever King Xerxes is mentioned for added fun. Read story: “Queen Esther” from your own story book. 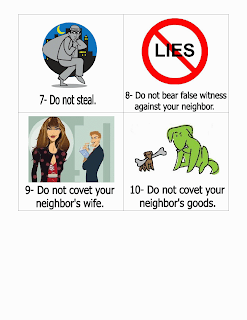 What did Mordecai warn Esther many times never to do? Never to tell anyone she was Jewish and not a Persian girl. Why did King Xerxes choose Esther to be his new queen? Because Esther was beautiful. Mordecai heard about two men plotting to kill King Xerxes. How did Mordecai warn King Xerxes? He had Esther tell him. Haman was an important man. Why was he so mad at Mordecai? Mordecai would not bow down to him. Mordecai would only bow down to God. What lie did Haman tell King Xerxes so he would allow him to kill all the Jews? Haman told King Xerxes that the Jews did not respect him or his laws. Why couldn’t Esther see King Xerxes whenever she wanted to? She has to wait for King Xerxes to invite her. What could happen to Esther if she went to King Xerxes without permission? He may become angry and have her killed. How did Esther get to see King Xerxes? She invited him to dinner. What did Esther do to save her people? She asked King Xerxes to save her people. Was Esther was courageous and obedient? Yes. How was she courageous and obedient? She faced her fears to save her people. She did what her cousin told her to do. There is a holiday I love and Purim is its name-o. P-U-R-I-M, P-U-R-I-M, P-U-R-I-M and Purim is its name-o. 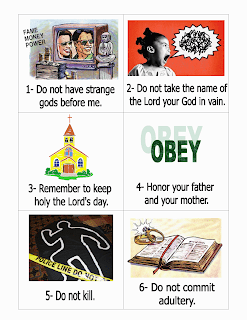 dltk-bible.com- Esther the Queen lesson with memory verse, teacher's guide, puzzles, take home sheet, coloring pages, crafts and activities, etc. Watch Queen Esther and ask questions after movie. daniellesplace.com- King Ahasuerus’ Golden Scepter Craft for Kids (scroll down for this). Have the students make a scepter like King Xerxes had. Paint a backboard with a Haman face. Players try to hit the face with wet sponges. 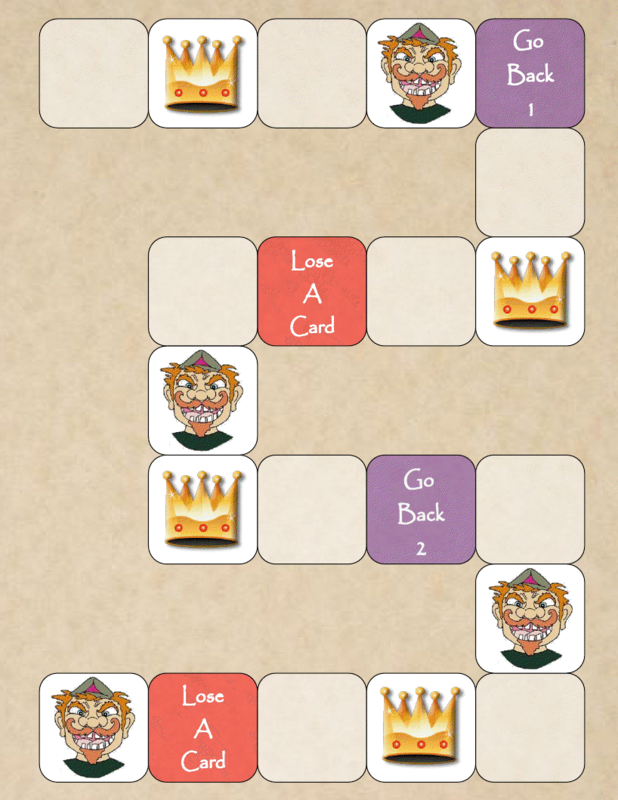 Play the game called "If I Were King or Queen". Children sit in a circle and tell what they would do if they were King or Queen. Draw a picture of King Xerxes’ head. Make crowns. Blindfold children and have them try to pin the crown on King Xerxes’ head. 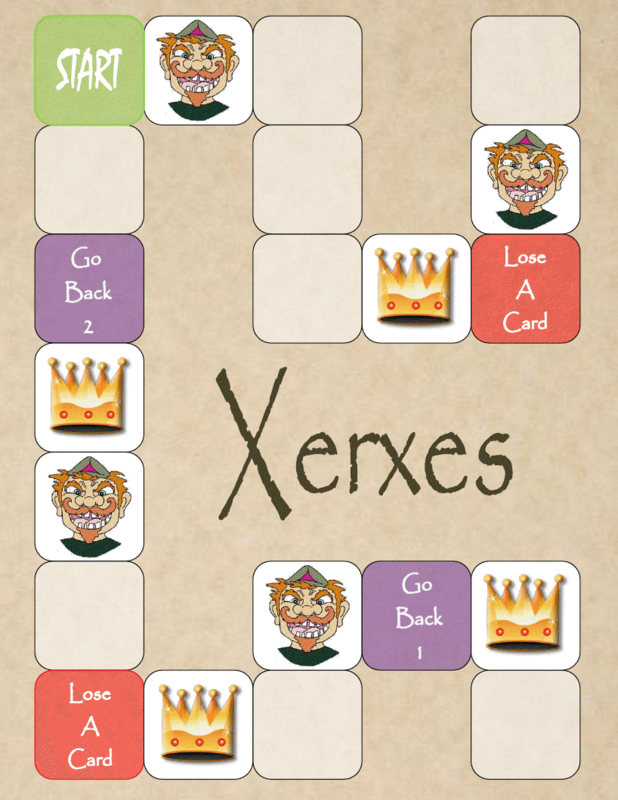 Xerxes- Be the first player to collect 4 Xerxes cards and win! Directions: Place the Xerxes cards near the game board. Each player places a marker on “START”. Players take turns rolling the die and moving clockwise the number of spaces rolled on the die. Players follow the directions on the space they land on. If a player lands on a picture of a crown that player takes a Xerxes card. If a player lands on “LOSE A CARD”, they must put one of their Xerxes cards back into the pile. If a player lands on a picture of Haman all players boo and hiss. The player that landed on Haman gets to take a Xerxes card from any player they choose. If you land on LOSE A TURN you lose your next turn. When a player has collected four Xerxes cards, that player is the winner. Optional: Play may continue until every player collects the four Xerxes cards. perpetualpreschool.com- On Purim, it is customary to send baskets (containing at least 2 different types of food) to friend's and family. I like to use strawberry containers. Decorate with ribbon (weaving is a great activity for 3's and 4's!) and fill with colorful tissue paper and treats! The children are always excited to exchange their baskets! Shape pretzels into the letter X and bake. Serve with or without the dip. I know what you are thinking . . . grits? Yes! These grits are THE best in the world and are great to serve during a church potluck breakfast. To keep it warm put in a casserole dish with a lid. They can also be easily heated up in the microwave. Pre heat oven to 350 degrees. Cook grits in boiling, salted water until done (about 25 – 30 minutes). Add cheddar cheese, garlic cheese and butter and stir until melted. Beat eggs with milk, add Tabasco and salt and mix together with grits mixture. Pour into a well-greased 2 quart casserole and sprinkle with buttered, crushed corn flakes and paprika. Bake about 45 minutes.